There a lot of people all over the world who suffer from hair loss. One of the possible treatments for that problem is hair transplantation surgery. However, not a lot of people choose this option. People who do, wonder how long will it take them to recover or what things need to be done in order to make the process of recovery easier. These people need not worry a lot because recovering from such a surgery is not difficult or demanding. A lot of people think that both surgery and recovery will be overwhelming but the truth is that they are not. They are both comfortable and quick. The most common thing that happens after surgery is that the patient will be wearing a head bandage. The bandage should not cause any worries because it is there in order to protect the wound at the rear of the scalp. The first night after the surgery is the time when patients need to be extra careful. It is essential to make sure that the transplanted area does not get rubbed against something or scratched. A person should not involve himself into any physical activities after the surgery. The patient will also receive certain medications that will ease the pain. The day after the surgery the patient will need to return to the clinic in order for the wound to be assessed. The bandage will also be removed and the hair will be washed. Because the transplanted area will be quite sensitive, the patient will be told how to wash and treat the hair. A person should listen to the instructions carefully because the next four days are very important. A person who washes the hair properly will not disrupt the grafts. Proper hair washing is important because it allows the hair to grow in the transplanted area. The doctor will advise the patient to continue the normal activities but on a smaller scale. However, any activity that might put pressure on the transplanted area should be avoided in the first month following the surgery. Lifting a heavy load is such an activity for instance. On the 10th day after the surgery the patient will need to go for a progress check. In case of a strip surgery, the staples will be removed when a person comes for a check up. Patients who underwent a FUE surgery will still need to come for a check up even though they received absorbable stitches or staples. A person should also avoid exposing the area to direct sunlight in the first six months after the surgery. 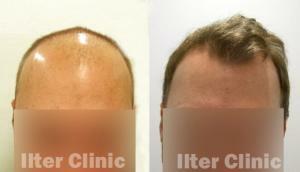 The transplanted hair should be at normal length and density some 10 months after the surgery. At that time the patient will go on a final check up. A person should know that he can talk to the doctor about any questions he might have about the transplant at any time. post op vagle, chest compressions, heart stopped, see cardiologist?